Alex Lester is a photographer, videographer and writer from Saltaire, West Yorkshire. 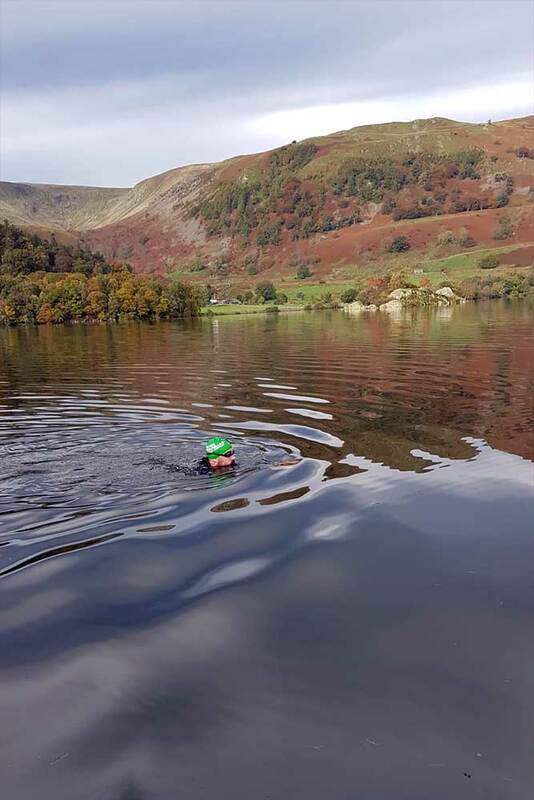 In October, Alex completed a charity swim across Ullswater, swimming the full seven mile stretch of open water in just under nine hours. 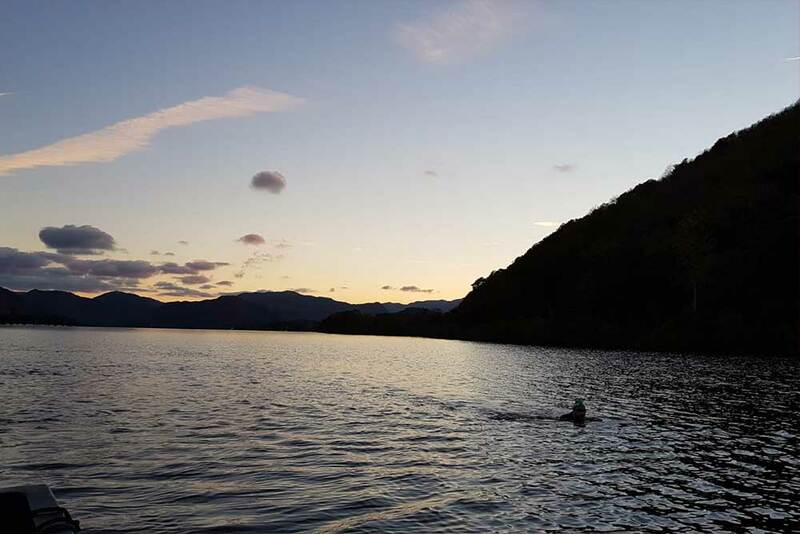 As a newcomer to wild swimming, Alex remebers how he prepared himself for the swim and why he’s now recommending a dip in Ullswater to anyone that’ll listen. It all started over a year ago while sitting on a coach to London. Travelling south from my base in Yorkshire, I knew I was in for a long ride and thus made sure I was properly prepared before setting off. When the time came to take my seat, my rucksack held a phone charger (essential for any journey over four hours), water, a selection of nutritious and not-so-nutritious snacks and Vol. Eight of my favourite indie mag, Another Escape. For those unfamiliar, Another Escape isn’t like most outdoor lifestyle publications. Sure, it boasts a wealth of stellar photographs and the kind of smell that can only ever be associated with high-quality stock, but when it comes to the narratives that feature throughout its pages, Another Escape stands out from the crowd. In this particular volume was a feature on three brothers from the Lake District. Their names: Robbie, Callum and Jack, aka ‘The Wild Swimming Brothers’. 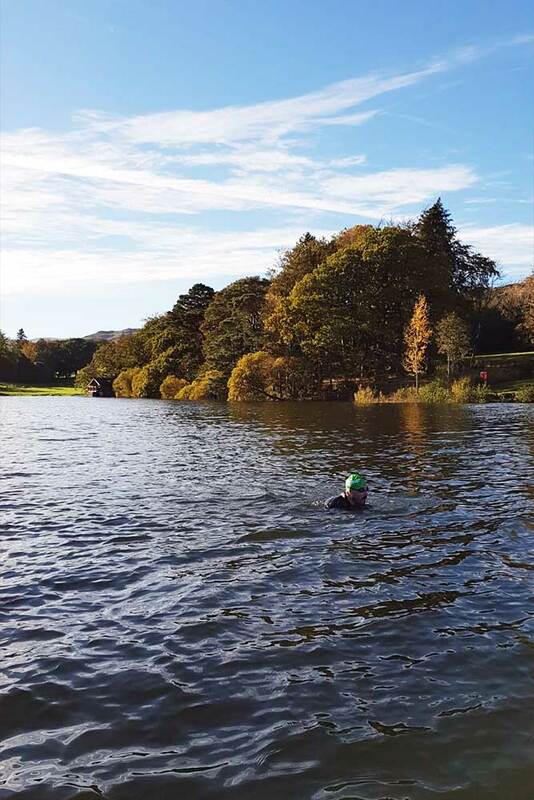 Throughout said feature it was detailed how the three boys swam the full length of the River Eden as part of a nine-day swimming challenge, all in a bid to inspire others to reconnect with nature through the practice of, you guessed it, wild swimming. As I flicked through the pages, discovering how the three brothers accomplished their ambitious goal, I couldn’t help but wonder why I hadn’t heard much about wild swimming before. After all, it’s not like I’d spent my life living in a landlocked territory, far from any source of open water. I’m a UK citizen – someone that’s spent the past 28 years never more than two hours from the greatest source of open water available to man. 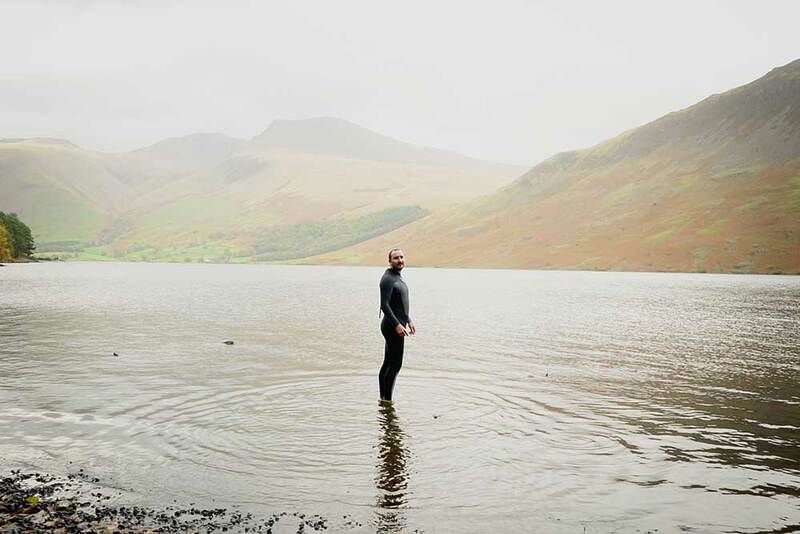 Needless to say, if the Wild Swimming Brothers’ aim was to inspire others to take the plunge and reconnect with nature through open water swimming, as far as I was concerned it was mission accomplished. Shortly after my visit to London, I made sure to take a dip in open water whenever I could. 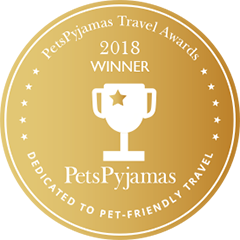 I swam in the Irish Sea when visiting family in the Isle of Man and also swam the width of Wastwater – the UK’s deepest lake – during a stay in the lakes with my partner, Helen. It’s worth noting at this point that I’m not a professional swimmer. Far from it. In fact, a mere 12 months ago it became apparent that I couldn’t even do breaststroke without moving my arms and legs at the same time – a feat Helen kindly pointed out resembled the aquatic equivalent of a horizontal star jump. Seriously, Michael Phelps I am not. What surprised me about open water swimming – regardless of my haphazard swimming style – was how refreshing, calming and invigorating it was, and that no matter how I felt prior to getting in the water, I always felt the same sense of tranquility whenever the time came to return to land. It didn’t matter if I splashed around like a five-year-old learning to master the basics of breaststroke, how cold the water was or how many jellyfish I ran into along the way, the feeling was always the same. In the months that followed, I joined a gym and took it upon myself to learn breaststroke for real. In next to no time (aided by a few YouTube tutorials, I must admit) I was gliding through the water like a fish, my personal bests improving with each and every length. When I first started swimming in the pool, I swam for half a mile before moving to a mile shortly after. This then evolved to one and a half miles and eventually two. Enthused by my progress, I took to the pool regularly, but soon found myself wanting more – a typically human trait if ever there was one. What was it that was missing from the pool? Sure, the water felt the same, but it tasted different. It was warmer, more synthetic. It just wasn’t right. Invigoration was replaced with irritation – caused not only by the congested lanes of the pool itself, but by the chemicals used to clean it too. Before long I found myself sat on the sofa discussing the best possible way to reconnect with my now fading love for swimming, and then it struck me. I needed a challenge, and if swimming in a pool wasn’t the best fit, maybe I’d be better suited to an endurance challenge across open water instead? 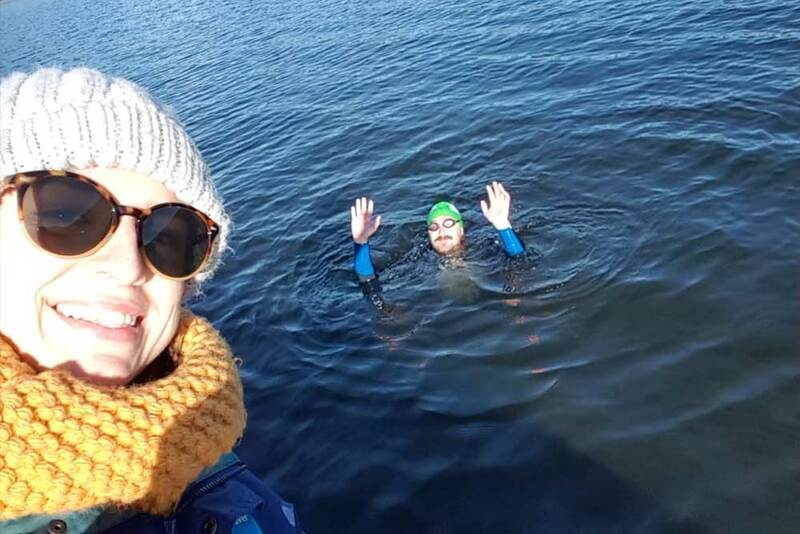 Originally, I’d flirted with the idea of swimming across Loch Ness but was soon discouraged after discovering its sheer length – a whopping 22.5 miles – was too long for a novice like me. Tail between my legs, I went back to the drawing board, Googling various lakes in the UK to determine which would be best suited to my rookie status. After a short deliberation with my partner, family and friends, it was decided that Ullswater was the best option. At 7 miles in length Ullswater is by no means a small lake. 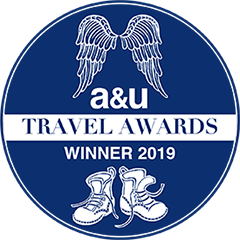 What’s more, due to its location in the Lake District, it often falls victim to strong winds that cause choppy waves, which would make an endurance swim such as the one I was planning virtually impossible to complete. Regardless of these minor details, I booked my swim for October 15th. Not only did this give me four months to train, it allowed plenty of time for me to organise a Just Giving page to raise funds for Macmillan Cancer Support – a charity that had done wonders for my family during what had been a tricky couple of years. It was during this time that I also reached out to Another Place, The Lake. 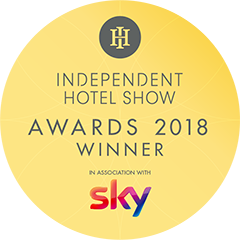 Having walked past the building’s white exterior a number of times during the occasional trip to Ullswater in the past, I was intrigued to discover more about the hotel and more specifically, whether they had a room that Helen and I could stay in when the time to complete my swim came around. Thankfully they did. So, there I was. With time counting down towards October 15th, a Just Giving page starting to generate interest and a bed secured for before and after the swim, I set about training for the mammoth task ahead. July rolled by, followed quickly by August and before I knew it, September had come around and my swim was no longer months away, but rather a short number of weeks. 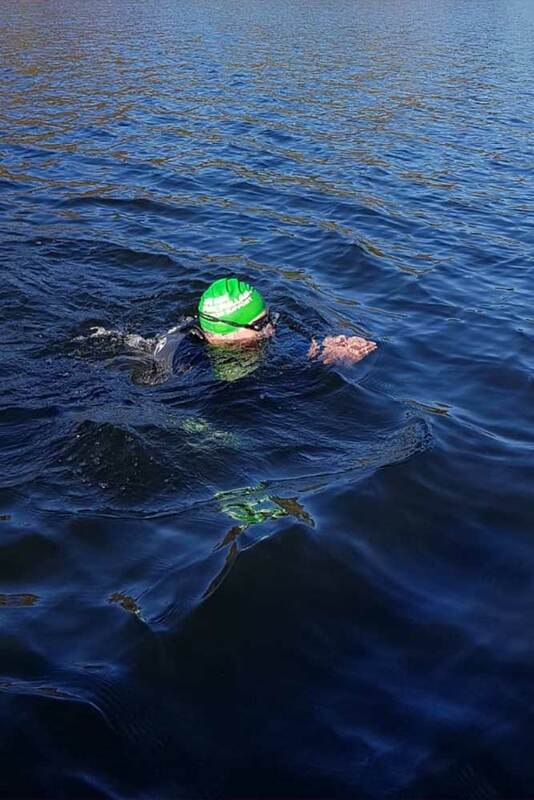 My training was going well and I was slowly starting to get used to swimming in a wetsuit – something that was essential given the time of year in which I’d planned to embark on my open water challenge. 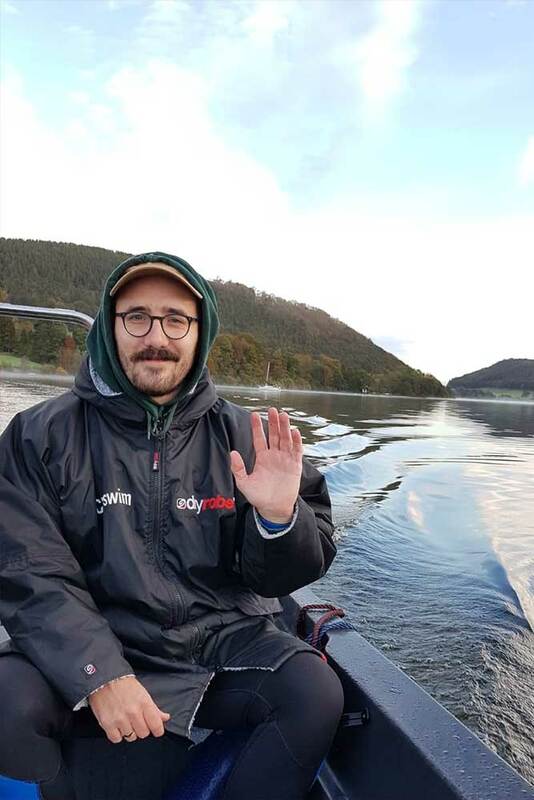 It was also during this time that Robbie Hudson – the eldest of the Wild Swimming Brothers – got in touch, offering some priceless words of wisdom in the weeks that preceded the swim. On a personal level, this was huge. Sure, Robbie and his brothers might not be celebrities in the traditional sense – I can’t see Robbie getting papped stepping out of a limousine, that’s for sure – but to me they are just as worthy of celebration as those plastered across our television sets and billboards. They were the reason I first plunged into the world of wild swimming and the reason I’m writing this blog today. As it turns out it’s true that not all heroes wear capes. Indeed, some wear wetsuits. With my training complete and Robbie’s supporting words lodged firmly in my brain, October 15th soon came around. Arriving at Another Place, The Lake the night before, I made sure to take one last practice dip before hitting the hay for some much-needed rest. I wasn’t expecting to sleep all that well, and was pleasantly surprised to discover that when our alarm went off at 06:30 I hadn’t woken from my slumber once. A real credit to the tranquil, calming nature of the hotel if ever there was one. That morning I ate a breakfast of eggs, toast and cereal before making my way down to the lake for a moment’s reflection. Knowing full well the task I was about to take on, I wanted to make peace with the lake and myself before setting off, concluding that whatever happened, everything would be ok. I thought about those family members lost to illness in years gone by and wondered what my Grandad would say if he knew what I was about to try and do. My thoughts concluded, I headed back to our room to put on my wetsuit. Helen was there waiting, having prepped all my feeds like a pro. Together we set off with our pilot – the wonderful Colin from Chillswim – to our starting point in Glenridding. The air was cool and a thin layer of fog covered the lake. Looking over the side of the boat I saw my reflection staring back, such was the mirror-like calm of the water’s surface. I’d gotten lucky with the weather. A good omen if ever there was one. At 09:30 I got in the water. At first, the cold clung to my torso before slowly warming between my skin and the wetsuit. Putting my palms together I reached out into the water and kicked my legs. The first stroke complete, I turned away from the boat and propelled myself forward, a big smile beaming across my face. I was back in open water, and man did it feel good.